Buy Lifeplan Potassium 300mg - 60 tablets in the UK from our online shop or directly from our independent Scottish store. Potassium is a mineral that contributes to the normal functioning of muscles and the nervous system, as well as helping to maintain normal blood pressure. Potassium contributes to the normal functioning of muscles and the nervous system, as well as helping to maintain normal blood pressure.Registered with the Vegan Society.Contains no: added sugar, salt, lactose, gluten, live yeasts, flavourings, colourings, preservatives or animal derivatives. As official Lifeplan stockist, we sell genuine Minerals A - Z directly from our shop in Scotland and online throughout the UK. Where can you buy real Potassium 300mg 60 tablets safely online? If you are wondering where you can buy Lifeplan Potassium 300mg - 60 tablets safely online in the UK, then shop with us. We are an actual health foods shop; with real people selling real foods and products. Our award-winning independent shop is located in Stirling, Scotland since 1976. You can buy our Vitamins, minerals and supplements and other genuine Minerals A - Z in store or safely place an order with us online or over the phone. 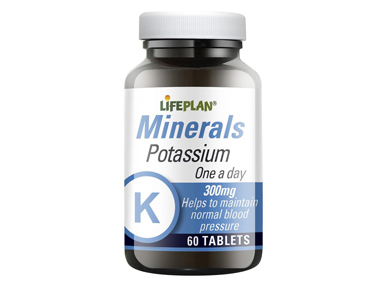 Potassium 300mg 60 tablets - Lifeplan Potassium 300mg - 60 tablets in Minerals A - Z and Vitamins and Minerals.